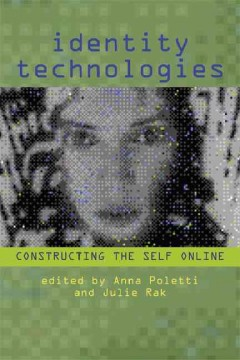 Poletti, A, & Rak, J 2013, Identity Technologies : Constructing The Self Online / Edited By Anna Poletti And Julie Rak, n.p. : Madison, Wisconsin : The University of Wisconsin Press, , DEAKIN UNIV LIBRARY’s Catalog, EBSCOhost, viewed 11 September 2014. “Identity Technologies “is a substantial contribution to the fields of autobiography studies, digital studies, and new media studies, exploring the many new modes of self-expression and self-fashioning that have arisen in conjunction with Web 2.0, social networking, and the increasing saturation of wireless communication devices in everyday life. This volume explores the various ways that individuals construct their identities on the Internet and offers historical perspectives on ways that technologies intersect with identity creation. Bringing together scholarship about the construction of the self by new and established authors from the fields of digital media and auto/biography studies, “Identity Technologies “presents new case studies and fresh theoretical questions emphasizing the methodological challenges inherent in scholarly attempts to account for and analyze the rise of identity technologies. The collection also includes an interview with Lauren Berlant on her use of blogs as research and writing tools.